Day two of Getting Krafty for this week's CASual Friday challenge. This is my newest snowflake die - it's a Sizzix (ETA - Actually a Lifestyles Crafts) die. I love the size and the simplicity of it. I cut it in kraft and then coated it in Stardust Stickles. A red card base and a simple A Muse (ETA - actually Savvy) sentiment and another Christmas card done for my pile. I have a number of projects I'm falling behind on - my Church Christmas, some horse cards for my sister and photo Christmas cards for a friend (this will be year 4) - so don't be surprised to start seeing a lot of these on the blog in the very near future! ETA: This card was chosen as a VIP! Gorgeous card! That die cut looks fabulous! wow! Gorgeous! Love the die and the touch of glitter is awesome! Thanks so much for playing with us at CAS-ual Fridays! Wow - so gorgeous! Love the simplicity but the POW factor too! This reminds me of those Scandinavian cookies you deep fat fry. Good enough to eat! Using the kraft paper for the element (versus the base) is so clever...and then to stickle it up and give it some pizazz is sheer genius! Looks stunning with the red & white. I agree with you - it's a wonderful die because of it's size but complete simplicity. Perfect for your CAS card! Wow, I love this huge snowflake! It looks fab in kraft/Stickles. Beautiful card! Love this large snowflake & the addition of sparkle. Great holiday card! Gorgeous!!! It wouldn't have been the same without the bling you added. Nicely done! Wow, what a classy CAS Christmas card! LOve the big snowflake die and the added sparkle with Stickles. Lovely! Great job cutting your snowflake die! I never think of that. Fabulous effect!! What a beautiful card, Ardyth!! 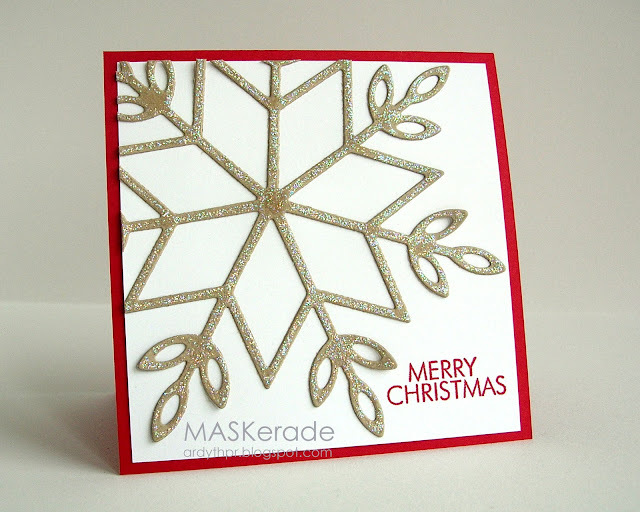 LOVE that snowflake...so pretty and so cool....wonderful card!! People will have to have your cards, so not surprising that you've got lots to make...can't wait to see them:)!! Thanks for sharing your creativity at CAS-ual Fridays this week:)!! You're rockin 'em this week! Congrats on the Friday Favourite shout. Could you please let me know where you purchased this die? I absolutely LOVE what you did with it!